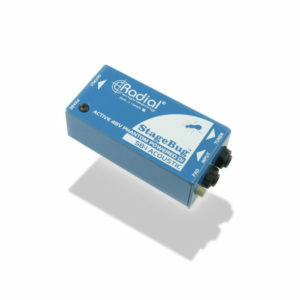 The StageBug SB-4 is a compact active direct box that has been optimized for use with piezo transducers, allowing upright basses, violins, cellos, and other acoustic instruments to be connected to the PA without compromising their tone or frequency response. The StageBug SB-4 allows you to retain the natural tone of your piezo-equipped instrument when amplified through a PA system. Unlike typical direct boxes, the SB-4 features a very high 5 meg ohm impedance that smooths out troublesome peaks that give piezo transducers a bad name. 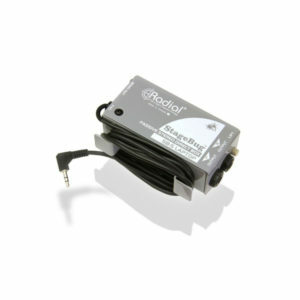 This higher impedance also broadens the frequency response for a more natural and pleasing sound. 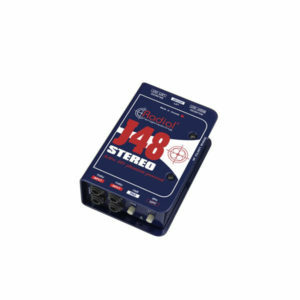 The active circuit balances the audio signal to enable long runs up to 100 meters without loss, while delivering spectacular linearity and low distortion throughout the audio range. 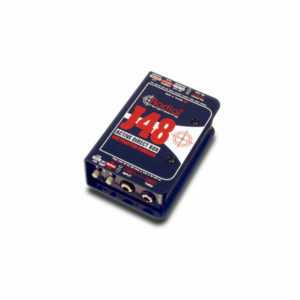 Output connections include an aux out for a stage amplifier plus a standard XLR output to feed the PA.
To help eliminate feedback on a live stage, the SB-4 is equipped with a high-pass filter and 180° polarity reverse switch. The high pass filter eliminates excessive bottom end which in turn reduces resonance that can cause the instrument to vibrate. The 180° polarity reverse helps reduce acoustic hot spots on stage by changing the phase relationship between the PA system and room acoustics which can combine at certain frequencies to create peaks.